The worst measles outbreak in the U.S. in almost two decades continues to grow. State health officials in Ohio say 68 cases have been reported in six counties, mostly among people in the Amish community who had not been vaccinated. That makes it the largest measles outbreak in any state since 1996. The Ohio outbreak appears to have started among unvaccinated Amish missionaries who picked it up on a trip to the Philippines, where measles is more widespread. Ohio has also been the epicenter of a mumps outbreak that has sickened at least 342 people since January, mostly in Franklin County, where Ohio State University is located. Health officials said this week they have distributed more than 11,800 doses of the measles-mumps-rubella (MMR) vaccine to try to combat the two outbreaks. State epidemiologist Mary DiOrio said that about half of those doses have been administered so far. Meanwhile, two Ohio state lawmakers said they would introduce legislation requiring children in day care to be vaccinated against preventable diseases including measles and mumps. According to The Columbus Dispatch, the state requires vaccines for kids entering kindergarten but is the only state in the nation without such a requirement for preschool and day care. Ohio is not alone in dealing with an uptick in measles cases this year. This week Tennessee reported its first measles cases in three years, saying five cases have been seen in the state since January. And earlier this year, Orange County, Calif., suffered its worst outbreak in two decades, with at least 22 people infected and 7 hospitalized. A typical case of measles begins with mild to moderate fever, cough, runny nose, red eyes, and sore throat, the CDC explains. 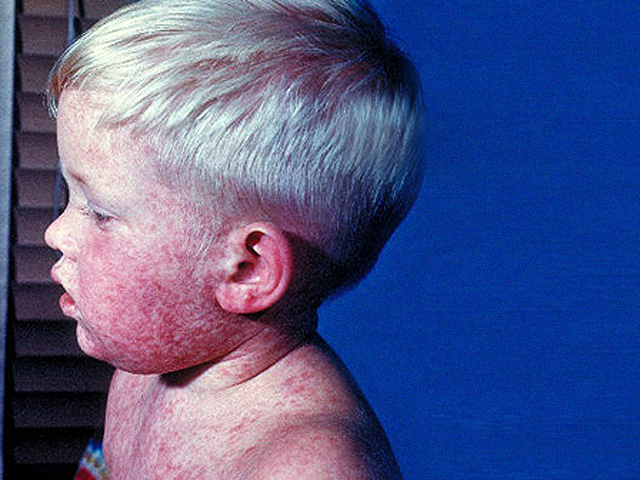 Three to 5 days later, a reddish rash appears and fever can spike to 104 degrees. Nationwide, the CDC says 187 cases of measles have been reported so far this year. For most of the last decade, the nation was seeing only about 60 cases a year. But since 2010, the average has been nearly 160. In 2011 the number of cases hit a high of 220. Measles has been considered eliminated in the United States since 2000, other than occasional outbreaks due to people traveling overseas, and then spreading it among those who aren't vaccinated.